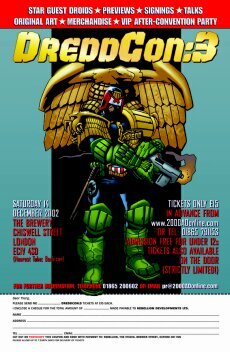 The third annual Dreddcon, a celebration of everything 2000 AD and Judge Dredd, will be held this December in a central London venue, The Brewery. Dreddcon visitors will get the chance to mingle with artists, writers and editors from all points in 2000 AD's amazing 25 year history, from legendary veteran creators to the latest hot young talents, plus the odd surprise guest. There will be a great deal to see and do on the day, including talks, panel discussions, masterclasses, 2000 AD artists sketching for attendees, films, slide shows and much more. There will also be an extensive dealer room where you can pick up 2000 AD related merchandise and other stuff from the wider world of comics and sci-fi, not to mention original artwork from 2000 AD creators, and there may well be sneak previews of some of the other projects 2000 AD and Rebellion are involved in. Refreshments will be available in The Vaults, a suitably spooky underground pub across the road from the venue, where drinks and food (generally of the pizza variety) will be available to all attendees (children are allowed in during the day to eat, so feel free to bring the kids). The Vaults will also host the post Dreddcon party, for which a limited number of tickets will be available to the public. Regular event tickets will cost £15 in advance. VIP tickets giving access to the post event party cost £25 in advance, from Tharg's Future Shop or by phone on 01865 791 153 (credit card facilities available). Children under 12 years of age will be allowed in to the daytime event free of charge, though there is a strict over-18s policy for the post event party.